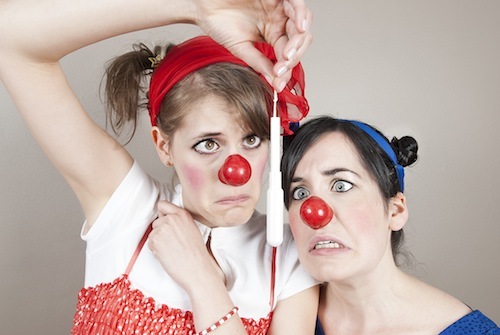 In Morro and Jasp do Puberty, presented as part of the 2015 Toronto Fringe Festival, clown sisters Morro (Heather Marie Annis) and Jasp (Amy Lee) are going through puberty, a time when everything is awkward and nothing is certain. Puberty might be unsure of itself, but this duo is anything but; having toured their shows at Fringe for almost a decade, they are masters of the craft. They have exquisite timing, hilarious dialogue, and a stubborn streak of empathy and melancholy that makes this show more than just a good time. But what a good time it is. Younger sister Morro has gotten her period, and as the expression on her face and the underwear furtively stuffed in the trash can suggests, she has no idea what to do. “Try-hard” older sister Jasp is learning new, tantalizing information about boys, but is having a hard time finding someone to turn theory into practice, other than her trusty diary and a stuffed animal. Morro is sporty, Jasp is a romantic. Together, they navigate the treacherous world of boys, bodies, and baseball (well, soccer-baseball). As the above suggests, if you are grossed out by body-related humour, you may have a difficult time with this show. One of the main set pieces is a toilet. The show pulls no punches when it comes to showing the details of menstruation. I wouldn’t characterize it as simple “gross-out” humour, though; as central and over-the-top as it is, it doesn’t seem puerile, just honest. Morro starts with a whisper and ends with a shout, and the show, similarly, gives a voice to what is often kept secret. You do not have to love clown ( I certainly didn’t think that I did) to love this show. Clown lets these ladies go big as they go home, but the larger-than-life voices and physicality might remind you of a lot of real 12-year-old girls. The laughter is laughter of recognition. We’ve all been there. We’ve also felt the sadness and disappointments of that age, and these emotions are played not just for laughs, but for genuine moments of feeling. The audience was game and supportive, and constant hysterics rocked the theatre, punctuated by bursts of clapping and cheering. Morro and Jasp let us in to their world, and encourage us to become a united community (or slumber party). This is helped along by plenty of audience participation, which added many extra laughs to the process, but occasionally was a bit of a drag on the timing. Fair warning: there is a bit of a “splash zone” in the front. No, it’s not what you think…more of a Cheeto dust zone. The show helps us look at things in new, extremely creative ways. A middle school slow dance becomes a routine worthy of Thriller. The “mystique” of sanitary products is lampooned, whether it’s the inconsiderate sound a pad makes when unwrapped, or ludicrous tampon instructions set to the famous tune from 2001: A Space Odyssey. It also functions as a sly rebuke against the garbage that we’re fed from a young age when it comes to what will make us popular and desirable, and how it shapes our expectations and behaviour. “They really print this,” says Jasp, showing us a magazine. The two do a lot with a rudimentary set, and extremely well-used props that gradually turn the stage into chaos. Depending on your age, you may recognize the music cues from your own middle school dance – I did. If you’ve ever been an adolescent on the cusp of adulthood, if you’ve ever been mystified by or frustrated with your own body, if you’ve ever felt conflicted over who you’re supposed to be, this show will touch your heart. When you’re not too busy laughing your guts out, that is. The show includes audience participation. Go see this show! Go on their website (morroandjasp.com) and support their trip to the Edinborogh festival.